Living in northern California, I take pride in having easy access to Peet’s Coffee. My pride crumbles to dust when I’m in London — not, you might reasonably think, the first city that comes to mind when you think coffee. 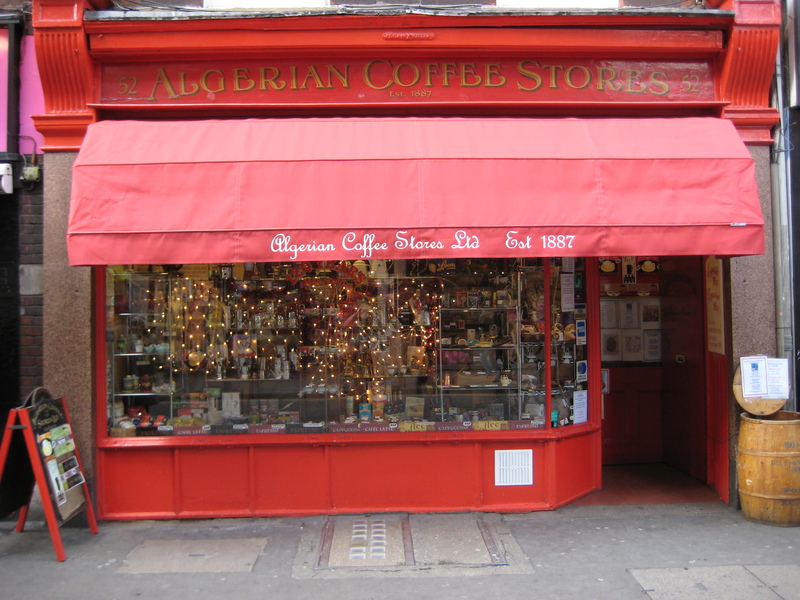 The Algerian Coffee Stores (I’m not sure why the store’s name is in the plural) sells the best coffee and the best tea I’ve ever bought. Bear in mind that I’ve spent the monthly equivalent of years in Italy and Greece and still maintain that stance. I’m partial to Indonesian beans. At Peet’s, I buy either the Aged Sumatra or Garuda. At ACS, only Indian Monsoon Malabar will do. Its flavor is deep, earthy, and comforting in the morning. The teas seem to be better than anything I can casually find in northern California. As a gift for Gary in Oakland, Ann usually buys a variety of teas — one part Darjeeling, one part Earl Grey, two parts English Breakfast or Ceylon, with a generous pinch of Lapasang — and mixes them. I’ve brought back this time some Darjeeling, first blush, and some Assam, whose delicacy I can’t find replicated at least at moderate expensive here in the U.S.
You’ll find the small shop on Old Compton Street in SoHo. Even if you’re just passing through London, stop in for an espresso. It’s a cozy, welcoming spot. Try espresso or regular coffee with with goat milk. Many people add half-half milk to their coffee but there is no better taste like goat milk. Try it and let me know. Hi, Hakim, I hope it’s not too late to respond. I just retrieved your comment and one other from the spam folder, which I will check more often. with reference to your comment, I will give that a try, because I adore goat milk yogurt. It’s the only kind I eat now. Thanks again. Completely agree. This place is to check out. Must amazingly few Londoners know of it… even if it has been around 130 years. Cardomom coffee is great there.